Transit • In a year and a half, the authority spent $610,000 on global expeditions. Tribune file photo Rep. Greg Hughes, chairman of the Utah Transit Authority, says travel is an essential part of the public agency's mission of innovation and expansion. Hughes says a recent trip to Switzerland opened his eyes to the possibilities of a mountain transportation system in Wasatch Front canyons. He also has in the last 18 months taken UTA-financed trips to Hong Kong, Australia and several U.S. cities. 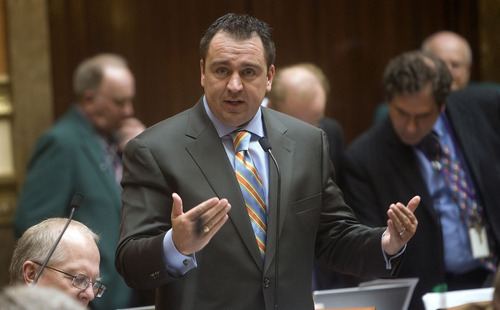 This file photo shows Hughes on the floor of the Utah House, where he serves as a representative of the Draper area. 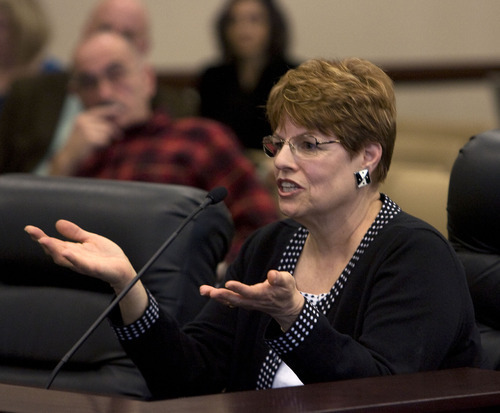 Tribune file photo Citizen watchdog Claire Geddes says Utahns should be appalled at learning how much the publicly funded Utah Transit Authority spends on travel for employees -- especially top brass. Utah Transit Authority General Manager Michael Allegra took 41 trips in the last 18 months, including seven abroad. He says the travel is all work -- not junkets. UTA spent more than $610,000 on travel during the period examined. This file photo shows Allegra last winter at UTA headquarters in Salt Lake City. Tribune file photo John Inglish in his last two years with the Utah Transit Authority criss-crossed the country and traveled the globe on the public agency's behalf, and on its tab. He retired from UTA in April from the position created for him -- CEO. The position will not be filled. 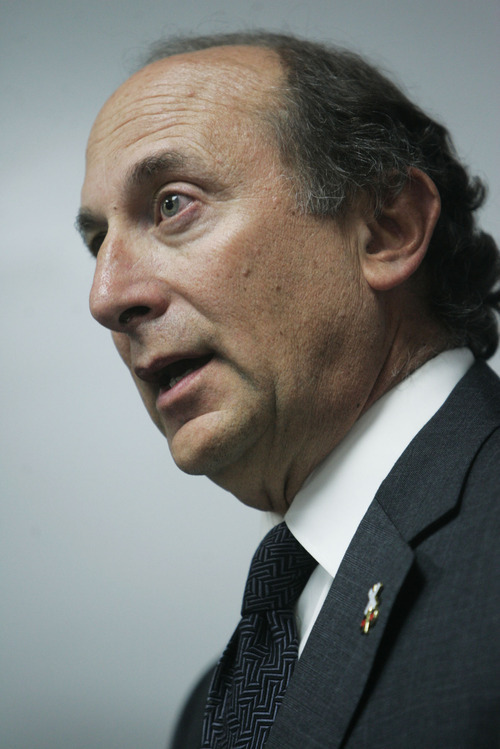 In this file photo from 2009, Inglish speaks at a UTA board meeting. His Utah-based job recently took him to Belgium, China, France, Germany, Hong Kong, Italy, Mexico, Spain (twice), Switzerland, Sweden, the United Arab Emirates and 17 U.S. cities. He averaged 1.6 out-of-state trips a month and appears to have been on the road almost constantly. This frequent flier wasn't an airline pilot, diplomat or tour guide. It was John Inglish, chief executive officer of the Utah Transit Authority. The mostly advisory CEO job for the public agency operating buses and trains was created at the same time that Inglish, longtime UTA general manager, was appointed to it two years ago with an annual salary of $364,406. He retired in April and the position won't be filled. UTA General Manager Michael Allegra  who took over day-to-day UTA operations from Inglish in 2010 and has annual compensation of $319,360  traveled almost as much, averaging 1.4 trips a month during the past 2.5 years, including to Australia, Cuba, Switzerland, Vancouver and several unidentified Asian countries, according to data obtained through open-records requests. Meanwhile UTA board members also traveled abroad to such places as Australia, Hong Kong and Switzerland. The entire board last year held one of its monthly meetings in Portland, Ore., to see transit projects there. UTA even has paid to take mayors or other elected leaders from Herriman, Murray, Ogden, Provo, Taylorsville and West Valley City to see out-of-state transit projects. "That's absolutely absurd," says Claire Geddes, an activist and frequent critic of UTA management. "How can they possibly rationalize that kind of travel with the budget problems they have? This is a group of people who are out of touch and have been for a long time. Utahns should be appalled." But UTA officials say they receive great value from travel, learning from mistakes and successes of other transit agencies. They say the travel is necessary to lobby for federal money and helps in developing strategies to change Utah's "car-first" culture. "To me, it is the best education, the best thing we have ever done," Allegra says about the travel, even if it came as fares have been raised twice in the past two years as the agency struggled to make ends meet amid tough economic times. Contrasts • Comparing UTA with the state's other largest transportation agency  the Utah Department of Transportation, which builds and maintains highways  reveals big differences in how much travel each allows, how it is tracked and the philosophy behind it. Information provided in response to open-records requests shows that in the past year and a half, UTA spent $610,840 on out-of-state travel  more than twice as much as UDOT's outlay of $275,250. Little of UDOT's travel was out of the country while UTA's international travel was extensive. UDOT was able to produce a list of out-of-state travel by employee, including the cost, destination and purpose of each trip. UTA was unable to do that, saying it was limited to providing travel cost totals for its various offices. At the request of The Salt Lake Tribune, UTA manually researched travel lists for some top officials. While UTA board members took numerous out-of-state and international trips, members of the Utah Transportation Commission  which oversees UDOT  took none. Meghan Holbrook serves on both boards (and is the Transportation Commission's representative on the UTA board). "They are different animals," she says. "For example, the Transportation Commission's job is to make sure we are putting the right amount of money on the right road project, and prioritize projects correctly," so official travel is mainly in Utah. "But UTA has a very different strategic vision. It is trying to change the culture here from 'cars-first' to convince people to use mass transit. Most of the places that have a lot of experience with that are in Europe or the East Coast of the United States," Holbrook added. "So that's where they travel." UDOT philosophy • Nile Easton, spokesman for UDOT, says his agency works hard to ensure any out-of-state travel is focused on legitimate UDOT missions. "Every single one of those trips has to be approved by the executive director." The department will allow travel, he says, if it "provides better training for our people, or something that brings new ideas, technology or innovations back to Utah." For example, the idea of accelerated bridge construction came from conferences attended by UDOT engineers and allows removing and replacing bridges over a weekend by building new bridges to the side of highways and sliding them into place, Easton says. Likewise, ideas for fancy new types of intersections to speed traffic flow also came from conferences. Much of UDOT's travel has been to lobby in Washington, D.C., for highway funds. The UDOT employee who traveled the most was Linda Hull, its director of legislative and government affairs and chief lobbyist. She spent $14,185 in the past year and a half, mostly on trips to Washington. UDOT Executive Director John Njord ranked No. 7 for travel among his agency's employees. He spent $5,209 on out-of-state travel in the past year and a half, mostly for trips to Washington, D.C.  plus conferences in Boston, Detroit, Oklahoma, Michigan, Florida and New Mexico. Top UTA brass • The top officials at UTA travel much farther and more frequently. UTA did not have individual cost information for Inglish and Allegra, but travel by the general manager's office  which paid for the travel of the pair  amounted to $79,625 in the past year and a half. Inglish made 43 UTA-funded trips, including 10 abroad, in the past 2½ years. Allegra made 41 trips, seven of them abroad. Inglish declined an interview and deferred to Allegra and UTA Board Chairman Greg Hughes to explain UTA's philosophy. Allegra says the most important reason for travel is to learn from other transit systems. "When I first started looking at light rail, when John Inglish and I were babies, we visited every light rail property in the United States. I think that benefited Utah tremendously by learning mistakes and the good things from everywhere else," he says. "Our network has really expanded beyond this country now. Europe and other places have been running transit systems twice as long as we have. And they have some incredible practices that we're advantaged by taking a look at." Benefits • Hughes, chairman of the UTA board and a state legislator, told the board at its August meeting how much he recently benefited from a trip to Switzerland. "It opened my eyes. I hear conceptually a lot about mountain transportation and how Switzerland with its efficiency was able to move people." But he said seeing the operations firsthand was crucial to understanding them and creating a vision of what is possible for the Wasatch canyons. "If I were Howard Hughes, or if I was related to Howard Hughes, I would pay for every one of my colleagues in the Legislature to go and see this," Hughes said, explaining that, without seeing it, "I don't think you can appreciate it." Besides the Switzerland trip, Hughes has also traveled to Hong Kong, Australia, San Antonio, Sacramento, Portland (three times) and Washington, D.C., for UTA. Eleven of the 15 UTA board members went to Portland last year for one of its monthly meetings to look at transit there. UTA also paid for Portland trips for mayors or city council members from Provo, Ogden, Murray, Taylorsville, Herriman and West Valley City to look at bus rapid transit or streetcar systems similar to some proposed for those cities. UTA did not say how much those trips cost. Noting that UTA doesn't have control over such things as local planning, zoning and condemnation, Hughes says "We are encouraging and asking other political jurisdictions to come and look at these things with us so we will be on the same page." UTA top brass aren't the only travelers. Andrea Packer, director of communications, for example, made 25 trips in the past 2.5 years. That included travel to Cuba, Switzerland (three times), Vancouver and unspecified Asian countries. The cost of her individual travel was not disclosed, although the "chief communications officer" office spent $49,230 on travel in that time. Nice severance • Much of UTA travel has been to allow top officials to appear at meetings of international transportation groups. Inglish did that while he was no longer involved in day-to-day UTA operations  but was drawing a big salary as a severance. Hughes explains that Allegra, as the then-No. 2 to Inglish in 2010, was being offered jobs by other transit agencies. 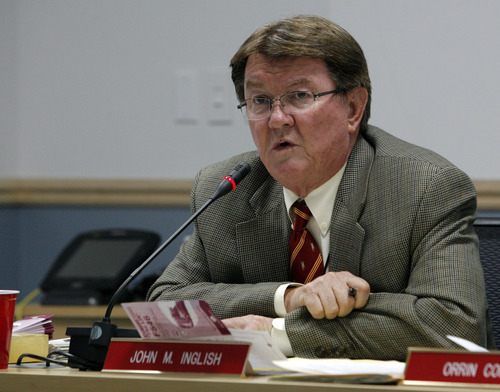 The board did not want to lose his experience at a time that Inglish, then age 64, was nearing retirement. Hughes says it decided to elevate Allegra to general manager to keep him. Inglish's contract as general manager allowed him to draw two years' salary as severance. Instead, he agreed to take a newly created advisory position of CEO for two years  mostly to represent the agency at many international groups and conferences. "We saw a value there versus a hard stop in his service," Hughes says. "It was a way for him to bring value over those two years when he wasn't general manager and really freed his time up." Allegra also serves on a host of boards and committees, requiring travel that increased as Inglish neared retirement. "It's for funding, for relationships, for networking," he says. These trips are work  not junkets, Allegra says. "I try to keep trips as short as possible. I just want to be back here with my family and at work. When I go, I go as quickly as I can and come back."